In the last 2 years I have met a number of wonderful artists, worship leaders, musicians and various music professionals, living in the Nashville and surrounding area. One of the most delightful new friends I have made here is a man named Dave Williamson. Many of you who are familiar with choral music in churches in the last 20 years will recognize Dave’s name from his extensive work with a number of companies and projects. I knew of Dave for over 10 years, since the company I co-founded (WorshipMusic.com) sold dozens of different resources in which the liner notes read “Arrangements by Dave Williamson”. This last year, a friend gave me a copy of the newly released book “God’s Singers” by Dave Williamson and he encouraged me to read it. I picked it up and quickly found myself enjoying not only the book, but entering into the world of the writer. Dave wasn’t just a dry writer, expounding to choir experts and enthusiasts. His warm stories, keen attention to the scriptures and clear passion for worship in the midst of the Body of Christ fills the book. But his topic is clearly the element of choirs. As I read, I realized that I wanted to meet Dave and learn more about his journey. This last week, Dave graciously consented to my request and offered to be videoed for a series of questions, the results of which are here below.If you are an old hand at choirs and the vitality they can stir up in the worship life of a church, this conversation may seem mute to you. But I would encourage you to consider listening and watching as Dave explores some of the underpinings of both his belief that the choir is God’s idea and how he encourages churches without choirs to reconsider their choices.Especially if you are like me, playing and leading in a “modern” or non-traditional church, you might not have had a church culture that included a choir. Dave speaks to all of us, but even more profoundly to the young churches who have left choirs behind.The interview is in three parts, allowing you to watch short segments as you have time. 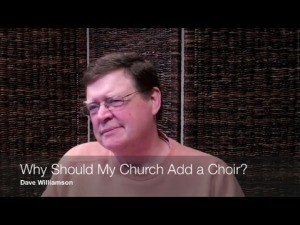 Part 1 – Why Should My Church Add a Choir? Part 2 – How Do I Start a Choir in My Church? Part 3 – An Inspirational Story & How to Contact Dave.. I would highly encourage you to consider Dave’s great new book, God’s Singers. It is a brilliant and warm invitation to the whole church to embrace the worshiping community group of the choir. PreviousWhat Size Screen Do You Need in Worship?